Free Basketweave Boot Cuff Pattern! 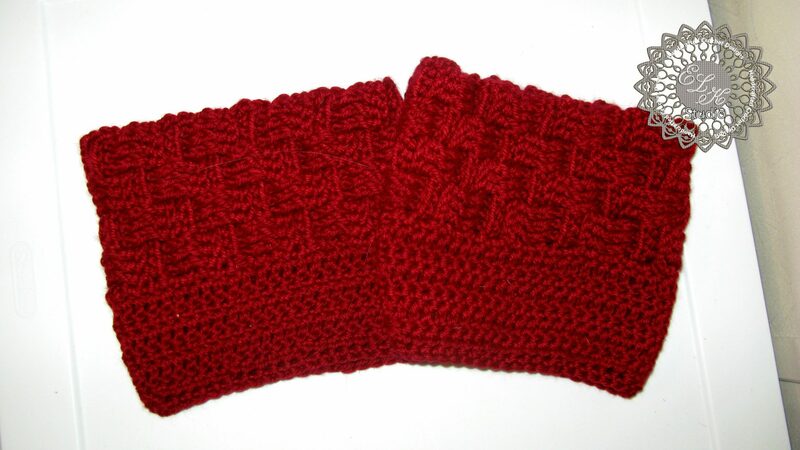 Last year I had made a pair of basketweave boot cuffs and posted them on the blog. I never got around to writing out the pattern but had someone ask me if I planned on releasing the pattern. Well, I finally got around to it and here it is! Here is a tutorial of the hdc2tog if you need help. The cuff has lots of texture and using Red Heart Soft gave the cuff the ability to have some “stretch” to it. It’s hard to have standard sizes for cuffs, so I come up with some measurements for the number of rows per inches and the number of single crochet stitches to use in Round 1 of the bottom part of the cuff.. I hope this will help you. The cuff in the photo shows a 13″ cuff and fit a 15″ size calf comfortably. Ch 2 counts as first dc throughout the top part of the pattern. Repeat Rows 4-7 until you have reached your desired length (width of calf) and fasten off leaving a long tail. Join ends together using the long tail and take the side just fastened off. Using the tapestry needle to sew the front loop only of the stitch and the bottom loop of each sc on the first row. Fasten off and weave in the ends. For the pattern on Round 7, you will dc2tog every 5th and 6th stitch, therefore make sure that on the beginning round one of your sc stitches they are divisible by 6. For example, 24, 36, 42, 48, 54, etc. Row 2: ch 1 and dc in same sp, dc in next sc and around, sl st in first dc. Row 4: ch 1 and dc in same sp, dc in next sc and around, sl st in first dc. Row 6: ch 1 and dc in same sp, dc in next sc and around, sl st in first dc. Row 7: ch 1 and hdc in same space, hdc in next 3 stitches, dc2tog, *hdc in next 4 stitches, dc2tog*, repeat from * to * across, sl st in first hdc. Row 8: ch 1 and sc in same sp, sc in next hdc and around, sl st in first hdc. You can sell your products made from this pattern but please link back to my pattern.. Please do not use my photos as your own. I would love it if you would favorite or queue this pattern in Ravelry! Thanks Rhondda! I’ll grab your too and thanks for sharing the pattern! Great pattern, love the basketweave stitch.